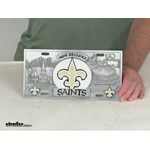 All of the trailer hitch covers we offer are either for 1-1/4-inch or 2-inch size hitch receivers, such as the Siskiyou Pittsburgh Steelers NFL Hitch Cover # FTHS160S that you mentioned. 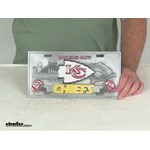 For reference all Steelers hitch covers are linked at right. You can easily adapt this item for use in your 2-1/2-inch receiver tube by also installing a Reese Titan Reducer Sleeve # 58102. I suggest you also use a lock # RH5-XL to secure both your reducer sleeve and hitch cover. 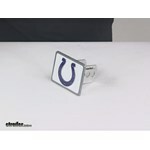 You are correct that the Siskiyou North Carolina Tar Heels "NC" Logo Trailer Hitch Receiver Cover # CTH9S does fit both 1-1/4-inch Class II and 2-inch Class III hitches. I both checked with the manufacturer and took a look at our inventory and two sets of brackets are indeed included, as shown in the photo. If you want a lock to protect this cover from theft I suggest hitch lock # 2866DAT which will fit both hitch sizes. 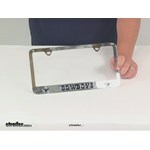 Will Virginia Tech Trailer Hitch Receiver Hitch Cover fit F-150? 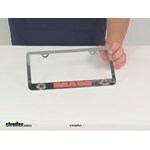 The Virginia Tech "VT" Logo Trailer Hitch Receiver Cover # CTH61S will fit your F-150's trailer hitch if the hitch is 2" x 2". There is no standard hitch size for an F-150 and though it is likely yours is 2" x 2" you'll want to make sure by measuring the opening of the hitch receiver with a ruler or tape measure; if it is 2" then the VT cover will fit. You will need a pin to keep it in place and # RM-910034 would work great for you. 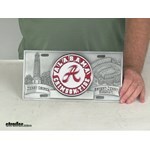 We offer many different professional and collegiate team hitch covers. 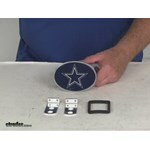 I have attached a link to our sports hitch covers for you to check out. We have 2 Seahawks covers, parts # HHCC2006 and # NHC128. 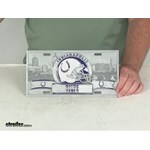 As long as your 2014 GMC Yukon XL has a hitch installed on it, (it should), yes the Pittsburgh Steelers Round NFL Trailer Hitch Receiver Cover # FTHS160S that you referenced will fit it. 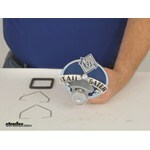 For a locking hitch pin you would want # 7683, for a standard hitch pin, # PC3. 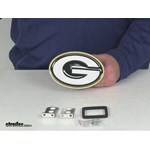 The Chicago Bears Trailer Receiver Cover, part # FTHB005S will require either a pin and clip, part # PC3, or a hitch lock, such as part # 40107. The pin and clip or hitch lock are not involved with the electrical system, they hold the hitch cover or other accessory in place. 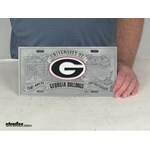 The Georgia Bulldogs G Logo Trailer Hitch Receiver Cover, part # CTH5S, will fit your 2 inch trailer hitch. I also recommend locking hitch pin # 7683 to secure the cover and deter theft. 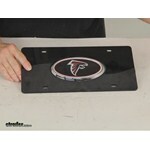 The rubber gasket that is included with the Georgia Bulldogs Logo Trailer Hitch Receiver Cover, part # CTH5S is intended to provide a small barrier to protect the hitch and the receiver cover. It is not designed to fit inside the receiver opening. The gasket has an outside measurement of 2-1/4 x 2-1/4 inches, and it measures 1/4 inch thick, so the distance of 2-1/2 inches you said you have from the end of your hitch to the center of the hitch pin hole should fit very well. A New England winter can indeed be tough on any exposed metal. 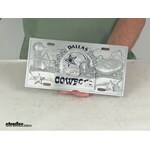 An anti-corrosive zinc plating, or full zinc construction, will help protect metal items like hitch covers that are exposed to the elements. 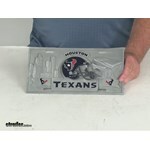 Or you can choose a cover that is made of non-corrosive materials, like the New England Patriots Logo Trailer Hitch Cover # FTHB120S that is made of pewter and aluminum (no metallic zinc plating needed). 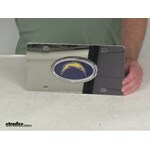 This cover fits 2-inch hitches. 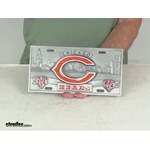 I have linked our main page for hitch covers. 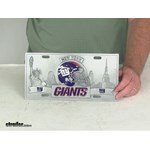 The New York Giants NFL Sport Plate - 3D License Plate # NSP120 does not have any rust-resistant coating on it so you would want to try to keep it out of the rain if possible since it has a zinc alloy finish. 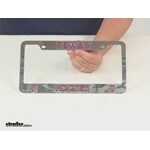 You can protect it from the elements using a license cover plate like the Stainless Steel # WT60027. This part also comes in White # WT8ALPCC8, Black # WT60020, and a variety of different colors which you can find on the linked product page. 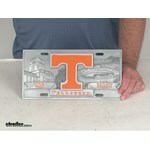 The Tennessee Power "T" Logo on hitch cover # CTH25S is a colored enamel. 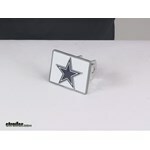 Since the color is integrated in the enamel it will take a long time for it to fade but it can eventually fade some. It won't completely wash out and turn white, it just wouldn't be as vibrant as new. The cover carries a 90 day warranty. On your hitch, you will need to measure the size of the square receiver opening in the hitch to find the correct size for a hitch cover. The majority of Class IV receiver openings will measure 2 x 2 inches. 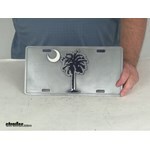 If this is the case on your hitch, then the hitch cover, # CTH27S, that you referenced will fit your hitch. The Firefighter Collage Trailer Hitch Cover, part # SHC805, does not require a locking pin, but you can use one to prevent theft of the hitch cover. The hitch cover can be installed and held in place with your existing hitch pin and clip or you can use the Hidden Hitch Pin and Clip, part # PC3. 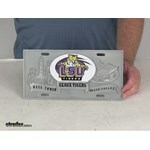 If you want to lock the hitch cover to your hitch you can use the Deadbolt Hitch Lock, part # 7683. 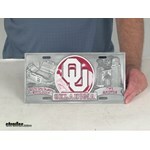 We do have an Ohio Buckeye trailer hitch cover that will fit a 1-1/4 inch hitch. It is # CHC322L. I also recommend a locking hitch pin, like # RH2-XL (# 7683 if you use a 1-1/4 inch to 2 inch adapter) to deter theft. 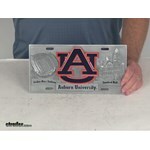 The part you referenced, Georgia Bulldogs G Logo Trailer Hitch Receiver Cover # CTH5S, is an all-metal hitch cover that provides three hitch pin holes for mounting in a 2-inch receiver. 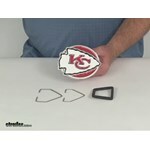 The measurements you requested, the distances from the back surface of the oval logo portion to the centers of the three hitch pin holes, are: 1-1/4-inches, 2-inches and 2-3/4-inches. 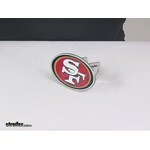 The linked photo illustrates. 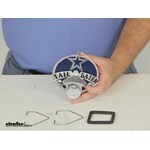 The 2 inch hitch cover you are interested in does require a pin and clip or lock to secure it into the receiver hitch. 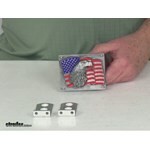 The pins you see on the back of the cover will fit inside the receiver and then the hitch pin or lock will slip through the side of the hitch, through the pin and out the other side of the hitch. 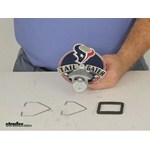 I have included a link to all our hitch locks below. 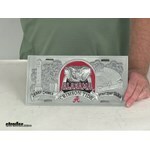 Yes, the Alabama Crimson Tide hitch cover, # CHC300A, has a 2 prong style shank with holes in it that will line up with the hitch pin hole on your receiver. You can lock the cover to the hitch using any lock that is a fit for your hitch. I recommend locking hitch pin # 7683. 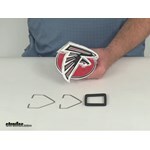 The New England Patriots Logo Trailer Hitch Cover, # FTHB120S, will fit the 2014 Volkswagen Tiguan if your hitch has a 2 inch receiver opening. 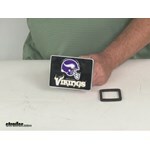 Unfortunately, if you have a 1-1/4 inch receiver opening, then we do not carry a Patriots cover for that size receiver hitch. 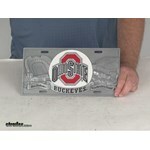 The Ohio State Buckeyes Trailer Hitch Receiver Cover, part # CHC322L is designed to fit a 2-inch receiver opening so if the Town & Country has a 2-inch receiver it should work for you. 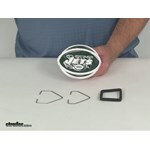 There is a rubber gasket included that is designed to fit against the face of the receiver opening and reduce rattling. With the rubber gasket installed the cover should work great in the hitch. 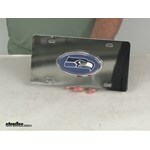 Yes, the Seahawks hitch cover, # NHC128, is made of zinc so it is metal and also corrosion resistant. I also recommend using a locking hitch pin, # 7683, to secure the cover in the hitch and deter theft. 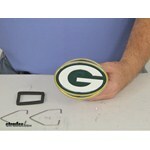 I have also included a link to all of the Seahawk hitch covers we carry. We offer one USF hitch cover for 2 inch hitches it is part # CHC341. I will include a link to it below. 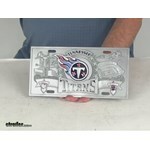 I pulled one of the Tennessee Sport Plates, part # CSP327 from our warehouse and took some measurements for you. 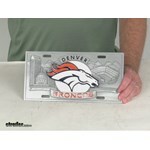 This plate measures 11-3/4 inches wide and 5-7/8 inches tall. The mounting holes are spaced 6-1/2 inches apart. 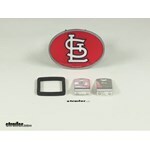 These dimensions are noted on the attached photo. 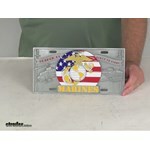 The Made in USA 2" Trailer Hitch Cover # AH-10255 that you referenced is made in the USA. Which is a good considering what the cover proudly displays. For a locking hitch pin you would want part # 7683. 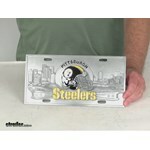 We offer several different styles of Pittsuburgh Steeler hitch covers, which you can see by clicking the provided link. For an inexpensive bare bones option, you could go with the # HCC2017 from Great American Products. For something that's more functional, go with the # AH-40288 Steeler Tailgater Cover with integrated bottle opener for popping the tops off those pre-game barley-pops. 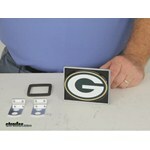 We have a few options for you if you have a 2 inch trailer htich receiver. 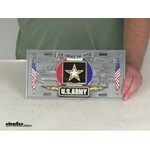 Look at parts # 034092100423 and # AH-10255. If you do not have a hitch pin lock for your receiver I recommend a lock like part # 7683 for a 2 inch receiver and part # RH2-XL.